Fairing and filling compounds are designed to repair and shape finished composite parts while retaining as much of the original piece strength as possible. The versatile compounds can be used for filling, adhering, building, shaping and finishing composites and other materials. 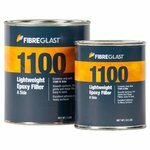 The 4100 Polyester Fairing Compound is fibrous — the resin comes with 1/8 inch fiberglass fibers embedded within it — to maximize repair and filler strength to fill deep cracks, gouges and voids. In addition to filling cracks and voids in fiber-reinforced plastics, the creamy, non-sag paste can be used to join and fillet composite parts, secure metal inserts, fabricate parts and bond dissimilar materials like wood, concrete and metal. 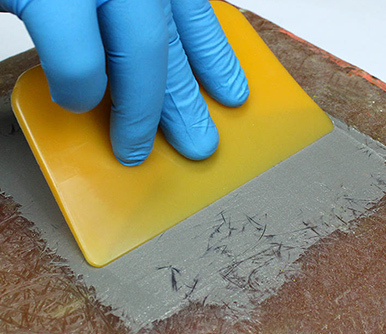 The Polyester Fairing Compound should be applied to rough or fibrous surfaces for best adhesion. Before using the compound to repair damaged composites, carve a trench with a dome-shaped bit of a rotary tool to eliminate sharp corners, narrow cracks and damaged material. 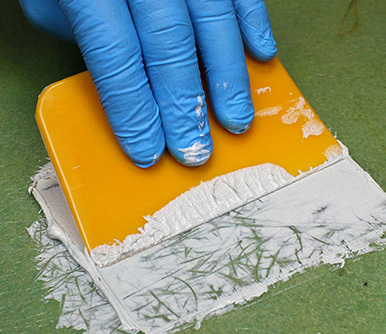 The surface should also be rough-sanded with 320-grit paper for best results. Use an air stream, not solvents, to remove dust from sanding or surface preparation. 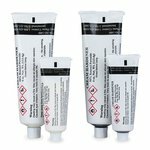 Solvents may create problems with repair adhesion. Mix the Polyester Fairing Compound with BPO Hardener at a ratio of 100R:2H by weight until the coloring of the hardener is evenly distributed. The mixed compound has a working time of 8–10 minutes and can be finished in 15–30 minutes at 77°F. Do not use heat guns or lamps to speed up curing, as they can cause excessive shrinking. For repeat filling, re-sand the cured surface before applying more compound. Polyester Fairing Compound When using Polyester Fairing compound, it must be paired with a BPO hardener in order to catalyze. This product is sold in quart and gallon sizes, and as well as prepackaged kits with the BPO hardener included. The 4116 Lightweight Polyester Cosmetic Filler is a versatile, unfilled paste that is workable, easy to handle and has good dimensional stability. The Cosmetic Filler can be used to create fine surface finishes on significant structural repairs made with the fibrous 4100 Polyester Fairing Compound. The filler is mixed with BPO hardener on a hard surface at a 100R:2H ratio by weight for a working time of 4–6 minutes. The surface can be sanded or filed after 15–20 minutes, with a final cure hardness of 86 Shore D. It finishes without pinholes and does not shrink or sink after curing. It is designed to smooth surfaces, fill composite pores, feather repaired areas and accept urethane, epoxy, lacquer and enamel finishes. Lightweight Polyester Cosmetic Filler Lightweight Polyester Cosmetic Filler needs to be combined with a BPO Hardener in order to catalyze. This product is sold in quart and gallon sizes, as well as prepackaged kits with the BPO hardener included. The 4118 Marine Epoxy Fairing Compound is a UV-stable paste with very little shrinkage for applications above and below the waterline. The white resin and gray hardener are mixed 1:1 by volume, not weight, until streaks are not visible. This compound has a potlife of 85 to 95 minutes, and will cure to be slightly flexible which will help to resist cracking. A repaired surface can be sanded easily after 6–8 hours, with a full cure in 5–7 days (the relative humidity must be below 90% in the work environment). The finished surface accepts almost all primers and paints. 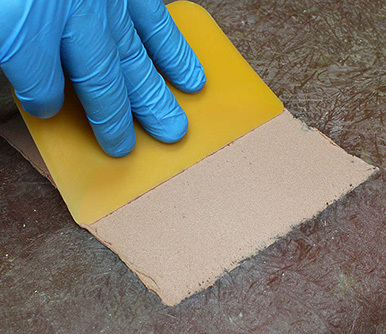 For reapplication, rough-sand the surface with 80-grit sandpaper for the best adhesive properties. 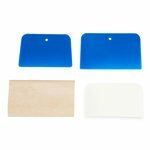 The Marine Epoxy Fairing Compound can be applied as thick as 1 inch in areas that can be worked on in 20–30 minutes. Do not apply the compound beyond the hardeners pot life. Equipment can be cleaned with mineral spirits or acetone. Marine Epoxy Fairing Compound When working with Marine Epoxy Fairing compound, allow for 4-5 hours between layers, and remember to lightly sand before applying any primer or paint. This product comes in quart and gallon kits, which include the resin and hardener. The 1100 Lightweight Epoxy Filler spreads smoothly with few sags and does not shrink. It can be sanded with standard shop tools. The paste, a mix of white resin and brown hardener, can be used on the surfaces of foam, wood and composites. The Lightweight Epoxy Filler cures with a hardness of 53 Shore D, which allows it to be spread thinly without becoming brittle. Thick sections should be applied in successive layers to avoid leaving air pockets; the layers do not need to gel or cure before adding the next layer. 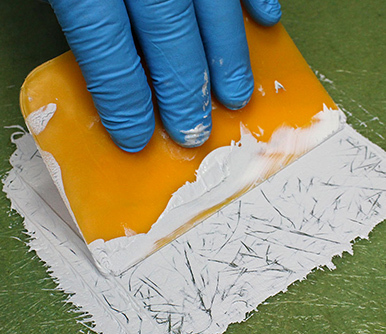 The Lightweight Epoxy Filler can be cured in layers as thick as 1/4 of an inch in one cycle. The epoxy filler has a longer pot life (25–30 minutes) and cure time than its polyester counterparts. It can be carved at 2–3 hours in 77°F temperatures, and sanded in 5–6 hours. The cured surface, although more durable and dimensionally stable than polyester, is not UV stable and should be clear-coated or painted to avoid degradation. Lightweight Epoxy Filler Lightweight Epoxy Filler is mixed 2:1 with it's accompanying hardener. This product is sold in quart kits, as well as cases of six kits. 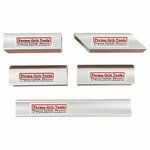 Perma-Grit Sanding Blocks - Perma-Grit Square Block 11" x 2"